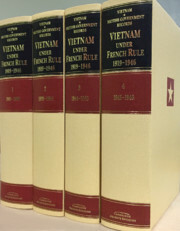 This 4 volume set contains 3500 pages of political reports, diplomatic despatches, and memoranda selected from British Government records illustrating the pursuit of nationhood by the regions which make up Vietnam today. Tonkin, Annam, and Cochinchina from which Vietnam was constituted, governed by the French as part of French Indochina since 1887, were territories over which Britain had never held sway; yet at various stages throughout the turbulent twentieth century, events conspired in surprising ways to provide the British government with a significant role in shaping and determining their future for many years to come. The documents have been selected from across all major departments of the British government - the Foreign, Colonial, Dominions and War Offices, the Prime Minister's Office, as well as the Cabinet Office, and occasionally from other departments. First in a new series: the years 1919-1946 follow the struggle for freedom from French Colonial rule and the occupation by the Japanese during the Second World War.